After four long years, finally…. I am so happy! I’ve waited so long to see a feather like that come from my needle. I’m also frustrated because I have to stop there, as I’m getting a nasty headache today. Wouldn’t ya know it? I’m off to medicate myself, and maybe I will feel like getting back to it b4 the day is done. Before I go, I want to say how much I appreciated the input on yesterday’s post. Thank you to everyone for your comments. They are BEAUTIFUL!!!!!!!!!!!! Hope the headache runs off and you are back to it before the end of the day! Go Randi!! Randi, they are just gorgeous! Congratulations on your success. I’ve always thought your quilting was wonderful, but I understand how happy you are to feel like you have conquered a technique. Way to go! That is fabulous!!! Those feathers are amazing. Everything is going to have feathers now isn’t it? You better tell your husband to guard his underwear! Maybe my Gammill will cooperate for me like that someday. Oh….you mean I have to use it first??? Oh Randi!!!! BIG BIG GRINS on the feathers (they are gorgeous) and big chuckles on your blog title today!!! You made me laugh out loud, I could “hear” (in the voice I think you have) you saying that!!!! Hope the headache abates soon and you’re back up to par! Look at that girl go! YAY for Randi. Now, wanna teach me?? You go girl! They are awesome Randi. I want lessons too Randi! way to go!!! and I hope you’re feeling better. Congratulations – the feathers are wonderful! I’m sorry to hear about your headache. I’m fighting a migraine today myself – Imitrex to the rescue. Fabulous, Randi!!! Can you come and teach me, now!? I’m sorry to hear about your headache — but I’m grinning for you and your beautiful feathers!!! Randi, That’s absolutely gorgeous!!!! I’m so envious!! I have got to start using my machine more so I can accomplish “something” that can resemble a feather. 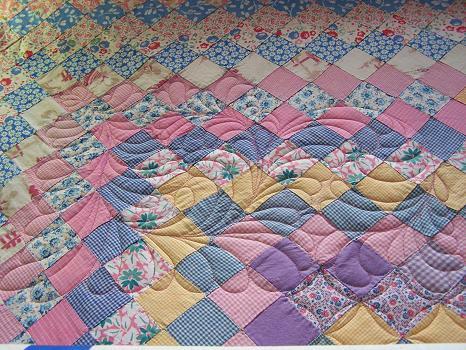 Is that quilt a vintage top, it looks like it? Well, you’ve inspired me. Thank you!!! Wendy P.S. 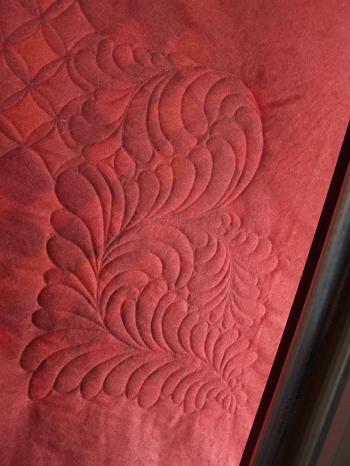 I’ve also been admiring your other recent quilting photos, their beautiful!!! Keep up the great work! The feathers are GREAT! You go girl!! Hope the headache goes quickly. Oh, Wow! I think you’ve got it! They are featherific! HOpe the headache is gone and isn’t the beginnings of the virus going around here (ask me how I know it starts with a headache). LOOKING GOOD! You have to say that with alittle accent. I hope the headache didn’t hang on too long.